Wall Maps - South Africa Provincial. Eastern Cape Provincial = 1 : 800 000 and 1.12m wide x 0.75m high. This is a detailed map showing the municipal districts, major and secondary towns and extensive road network of the Easstern Cape. Free State Provincial = 1 : 600 000 and 1.12m wide x 0.87m high. This is a detailed map showing the municipal districts, major and secondary towns and extensive road network in the Free State Province. Gauteng Provincial = 1 : 250 000 and 0.91m wide x 1.09m high. Detailed wall map covering Gauteng Province showing highways, major routes, major and main roads with route markers. The map includes distances between junctions, provincial boundaries and color-coded municipal boundaries. toll roads and toll positions, spot heights with names and indexes of place names and municipal areas. KZN Provincial = 1 : 600 000 and 0.88m wide x 1.06m high. Detailed map showing the municipal areas, districts, major and secondary towns and extensive road network in KZN. Limpopo Provincial 0399 = 1 : 650 000 and 1.08m wide x .074m high. This is a detailed map showing the municipal districts, major and secondary towns and extensive road network in Limpopo. Mpumalanga Provincial = 1 : 600 000 and 0.99m wide x 0.88m high. This is a detailed map showing the municipal districts, major and secondary towns and extensive road network. North West Provincial = 1 : 700 000 and 0.98m wide x 0.65m high. This is a detailed map showing the municipal districts, major and secondary towns and extensive road network of the North West Province. Northern Cape Provincial = 1 : 1 000 000 and 1.14m wide x 0.89m high. This is a detailed map showing the municipal districts, major and secondary towns and extensive road network of the Northern Cape. Western Cape Provincial = 1 : 700 000 and 1.09m wide x 0.84m high. 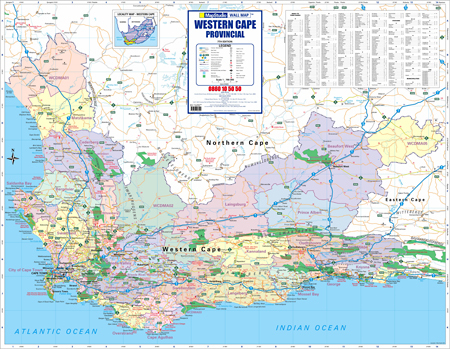 This is a detailed map showing the municipal districts, major and secondary towns and extensive road network of the Western Cape. Sample of KZN Provincial Wall Map Detail / Enlarged. Sample of Limpopo Provincial Detail / Enlarged. South Africa Provincial Poster in Tube - Wall Map. airports, places of interest, national parks and reserves. Packaged in a convenient tube.